This transportable computer was compatible with the IBM PC-XT. It had a built-in 9" monochrome monitor, one or two 5"1/4 disk-drive (320k) and a 10 Mb hard-disk for the "1 disk model". This hard-disk was half thinner than "classic" hard-disks of that time (Slimline technology). It also had a color graphic board but the built-in monitor was monochrome (no color model was available). It was not completely useless as it enabled to display 8 shades of green... Hopefully it was possible to connect an external color monitor ! The Eagle Spirit was really IBM PC compatible (hardware & software) and could be booted with the original IBM PC boot disks. The disks capacity and format procedure were the same. The graphic resolution was the same as the IBM PC: 320 x 200 with a character matrix of 7 by 9 pixels. This was a good example of the low levelling effect of the IBM PC compatibility. The Eagle PC, launched one year earlier, had a high resolution of 720 x 352 with a character matrix of 11 x 19 pixels! First models had different keyboards where you had to press CONTROL+ALT+N to activate the numeric keypad. 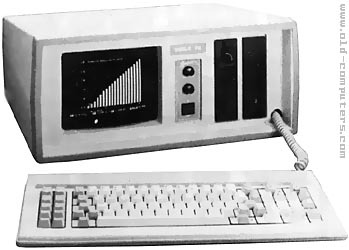 Later models had IBM PC style keyboards with LED signals. As the Eagle spirit weights 15kg, a transport suitcase was available! In 1983, I bought an Eagle Spirit (transportable) and still have it. It was self-contained in metal luggage. We called these luggables. The Spirit accepted 2(then new) 256k chips and ran both CP/M and DOS. I had 512kb of RAM. Because of a copyright battle they had to change their BIOS (which was almost 100% compatible with IBM's) to another spec which didn't work quite as well. When the stock went public it went sky high. Later, the founder was killed in an auto crash and the stock cratered. I had an Eagle Spirit lent me by my father in law; I wrote a PhD dissertation on this computer in 1988-1990, and later used it in my first teaching job. It was not too temperamental, was pretty reliable (starting up, the HDD sounded like a jet taking off), and had 2 floppy drives and a 20 MB HDD. It was robust for that time, and though quite heavy, in those days any computer approaching "portability" was a Godsend. The keyboard attached to the front, covering the floppy drives and tiny monitor; the black plastic handle was in the back. One had exercise caution in carrying it so as not to bump it against doorframes and the like, which ran the risk of putting the hard disk out of whack. BUILT IN MEDIA One or two 360 kb 5''1/4 disk-drives and a 10 Mb hard-disk (slimline) for the ''1 disk model''. see more Eagle Computers Inc. Spirit Ebay auctions !